One of the issues with legged robots is the development of gaits. Typically gaits are developed manually, which is a slow and tedious process. In this project we report our results of autonomous evolution of dynamic gaits for the Sony Entertainment Robot, AIBO and its prototype. Fitness is determined using the robot's digital camera and infrared sensors. Evolved gaits are faster than those created by hand. Using this technique we evolve a gait used in the consumer version of AIBO. When an entirely new robot is constructed it is necessary to produce gaits for it, and these new gaits need to be created quickly so that other members of the software development team can use the gaits in developing higher-level behaviors. When creating a new version of a robot, or make adjustments to an existing robot, existing gaits must be tuned to the newer hardware. New gaits are worth generating for specialized terrain or environments. 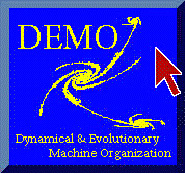 An evolutionary algorithm is used to evolve controllers for the robot. A trial consists of running torwards one end of the pen. Score is a function of average velocity and straightness. The robot uses its own sensors to evaluate individuals. Fitness is the average over three trials. Using our evolutionary algorithms we successfully evolved various dynamic gaits for Sony's OPEN-R prototype robot and Sony's ERS-110 robot. 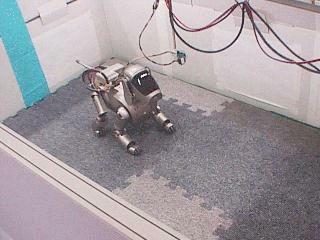 One of the dynamic gaits evolved on the ERS-110 is used on the first consumer version of AIBO. Evolving on a flat surface. Evolving with ridges (to improve robustness). Results from evolution on a flat surface. 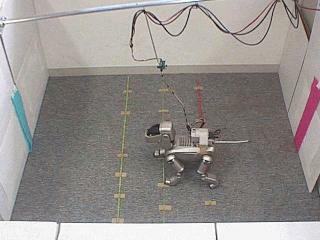 Notice the stumbling when gait is tried on a different AIBO. Results from evolution on a surface with ridges. Gait works well on a different AIBO. Fujita, M. Hornby, G.S., Takamura, S., and Yamamoto, T. (2000). Autonomous Evolution of Locomotion for a Pet-type Robot using Genetic Algorithms. Takamura, S., Hornby, G.S., Yamamoto, T., Yokono, J., and Fujita, M. (2000). Evolution of Dynamic Gaits for a Robot. IEEE International Conference on Consumer Electronics. pp. 192-193.